With the bullion industry transformed by sites like Compare Platinum Prices and Compare Silver Prices, Liberty Coin & Precious Metals is taking the opportunity to show the public they are willing to make less. The Platinum American Eagle is a rare specimen. Beautiful and one day to be a numismatic coin. 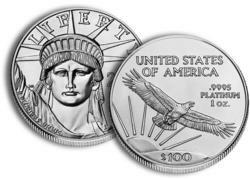 Liberty Coin & Precious Metals proudly announces the addition of a platinum page on their website. For over two years now, Liberty Coin & Precious Metals has been offering investors wholesale gold prices and silver prices. But, according to Compare Platinum Prices, Liberty Coin & Precious Metals is the leading platinum bullion dealer on the web, featuring products like the Platinum Eagle, Platinum Platypus, Platinum Maple Leaf and Platinum Johnson Matthey and Engelhard bars for competitive prices. As can be seen at Compare Platinum Prices, Liberty Coin & Precious Metals is the low price leader on all the main-line retail platinum products. Buying gold and silver as a way of hedging against inflation, many United States citizens are positioning themselves in such a manner to escape the potential ravages of dollar devaluation and economic collapse in the United States. Many individuals have overlooked platinum as the investment it is. Banks like JP Morgan have even recently purchased huge amounts of platinum. Why? Well platinum is the rarest of the precious metals, even rarer than gold. 75% of platinum comes from mining operations in South Africa, and with the worker strikes that have taken place there over the past months, many analysts are anticipating platinum supply issues. Many individuals worry about the possibilities of gold and silver confiscation similar to what took place in the 1930s in the United States. They seek numismatic coins as a way of hedging against the possibility of gold and silver nationalization, since it is believe collector’s coins such as Saint Gaudens, Indian Head, and Liberty Double Eagles might be exempt. Platinum coins offer the same sort of security. Platinum has never been considered a monetary metal like gold and silver, and so it is does not come with the same risks as gold and silver. If you are considering purchasing numismatic coins as an investment without the risk of gold and silver bullion, then Liberty Coin & Precious Metals would like to urge you to consider buying platinum as well. MS-69 Platinum American Eagles offer the truest of contemporary numismatic coins. And since there is no cheaper place to buy platinum, Liberty Coin & Precious Metals looks forward to speaking with you over the phone.